Launched in 2006, the Drought Tolerant Maize for Africa (DTMA) project aims to mitigate drought and other constraints to maize production in sub-Saharan Africa, increasing maize yields by at least one ton per hectare under moderate drought and with a 20 to 30% increase over farmers’ current yields, benefiting 30-40 million people in 13 African countries. The project brings together men and women farmers, research institutions, extension specialists, seed producers, farmer community organizations, and non-government organizations. It is jointly implemented by the International Maize and Wheat Improvement Center (CIMMYT) and the International Institute for Tropical Agriculture (IITA), in close collaboration with national agricultural research systems in participating nations. Millions of farmers in the region are already benefiting from the outputs of this partnership, which includes support and training for African seed producers and promoting vibrant, competitive seed markets. Maize is grown on some 33 million of the total 194 million hectares of cultivated land in sub-Saharan Africa. It is the region’s most important food crop. Smallholder farmers in 46 countries with a combined agricultural population of about 553 million produce maize under diverse and varied agro-ecologies and socioeconomic conditions. Sixteen of those countries sow 25 to 65% of their total cultivated area to maize. Currently at only 1.8 tons of grain per hectare, average maize yields in Africa are far below the crop’s genetic potential. The causes of this include drought, degraded and infertile soils, diseases, insect pests, and weeds, as well as limited use of improved seed or chemical fertilizer. Poverty is rampant, a significant portion of the population is food-insecure, and one-in-four African children under the age of five is undernourished. Maize agriculture in Africa is almost completely rainfed and thus depends on the region’s increasingly erratic precipitation. An estimated 40% of Africa’s maize area faces occasional drought stress, with yield losses of 10-25%; a quarter of the maize crop suffers frequent drought, with losses as high as half the harvest. Total crop failure is common in severe droughts. Economic analyses suggest that, if widely adopted, drought tolerant maize seed can provide African farmers with hundreds of millions of dollars in benefits in increased grain harvests and reduced risk. Over 2007-12, participants marketed or otherwise made available 60 drought tolerant hybrids and 57 open pollinated varieties to smallholder farmers (Table 1). The varieties match or exceed the yields of widely sown commercial seed when rains are good, and yield 20 to 30% more under moderate drought conditions. In addition to drought tolerance, the new varieties and hybrids also possess such desirable traits as resistance to major diseases (e.g. maize streak virus, Turcicum leaf blight, and gray leaf spot) and superior milling or cooking quality. Close to 29,000 tons of seed was produced in the 2011/12 season (Table 2)—enough to sow more than 1.1 million hectares, benefiting about 2.9 million households or 20 million people. Production of drought tolerant maize seed could reach 60,000 tons by 2016. Engaging government officials in policy dialogue has helped to fast-track varietal releases and fostered competitive seed markets and more widespread access to quality seed at affordable prices. To help ensure farmers’ access to the best possible products and services, DTMA has coordinated various capacity-building events and activities for maize breeders, technicians, seed producers, extension workers, non-government organizations, and farmer groups. DTMA scientists have also provided technical and advisory support to 50 African undergraduate and 28 African graduate students. Initial funding for DTMA has come from the Bill & Melinda Gates Foundation, the Howard G. Buffett Foundation, the U.S. Agency for International Development, and the UK Department for International Development. 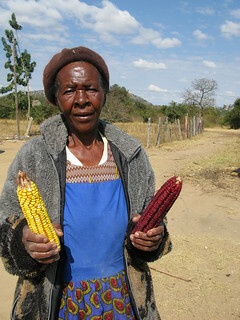 The 2012-16 phase is funded by the Bill & Melinda Gates Foundation and aims to expand smallholder farmers’ use of drought and other stress tolerant maize seed to benefit 30-40 million people and provide added grain worth US$ 160-200 million each year in drought-affected areas of sub-Saharan Africa. New and old varieties refer to those released after 2007 and before 2007 (but leveraged by DTMA), respectively.